9. 2013 is the first year since 1987 that has four different digits. Which one is your favorite fact? Have you heard any fun facts lately? Comment and let me know! No. 8. How you measure it? I better check the link you put. I really like # 7 and #8!! I smiled at them all but 3, 7 and 8 are my favourites… Thanks! I like number one because of all the blessings in my life! 9 made me laugh because I found myself counting it out on my fingers! Apparently I’m one of the crowd. I especially like 7 & 8. Also the one about blind people smiling is awesome. My aunt who is blind has one of the brightest smiles of anyone I know, especially when she sings. She was always asked to sing often, and I think it was as much for her glowing spirit as her voice. #7 for me – that is just too cute 😉. Thx for sharing. #6 made me lol. Hang out with cats and kittens??!! NUMBER 6! I want all the cats! So many cool facts here. I love otters. I think they’re one of the coolest animals. And I definitely want to find that cafe in Korea. This a really cool post. Thanks so much. If you haven’t checked out HAPPSTERS yet, what are you waiting for? 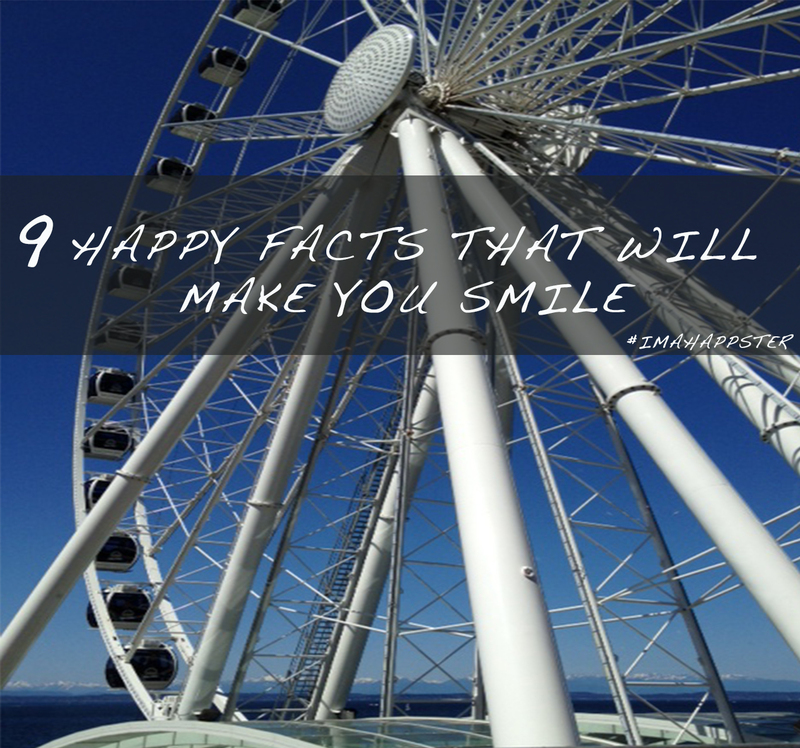 At the very least, check out this reblog – 9 Happy Facts That Will Make You Smile. #8 is my favorite! That’s the way life should be!!! #3, #7 and #8! These are wonderful! Thank you! I like #9 since I was born in 1987 and am getting married in 2013 – funny would have never figured that out but I love dates with some strange significance! I almost tripped over myself running to the source of the cafe with cats. I am immediately telling everyone about this. Great site–thank you for visiting my blog! #2 and #8 are my favorites! Laughter keeps the soul young. I’ll have to check out more about Bhutan. It sounds like a cool place! Thanks for stopping by the Clearly Conveyed Communications blog and for the follow. I I’m looking forward to checking out more of your content. I liked the otters and the blind smiling facts. Very neat and nice assortment! #7 So sweet about otters. If only humans can be so connected. Thank you for such a feel good post. No 7 and 3 for me ! What a lovely post! I’m smiling inside and out now. Number 7 is definitely my favourite. Thank you for visiting my blog and for following me. I’m glad it brought me to this gem! Love this post! And awww… the otters win the prize for me!! I want to hang out at a cat café! I hope I can laugh more than 13 times – thanks for following me. I apologize in advance that over the next week or so you will be getting lots of posts – I’m moving a blog from Xanga to here, and there are lots of posts I don’t want to lose. Once moved, I will be down to a more reasonable amount of posting. Oh, I love the one about the blind people. That is such a sweet thing that they experience the emotion and joy even though they cannot see! I also like the otters holding hands, so cute! Thank you for visiting my blog today and for the follow! I have a difficulty choosing between 7 and 9, the otter’s life in sleep is so sweet to imagine and the digit thingy was quite a revelation, so obvious and yet obscure. Lest I forget, thanks for the like.